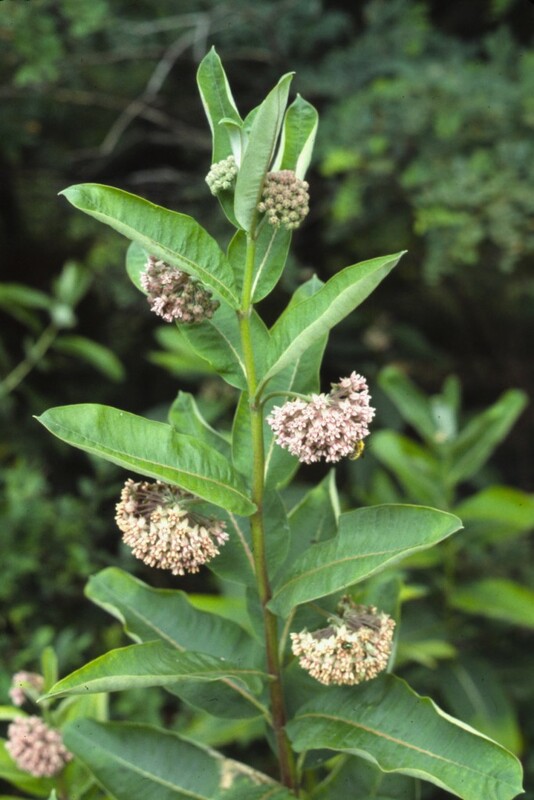 Asclepias syriaca.M. B. Gargiullo. (ca 2005). 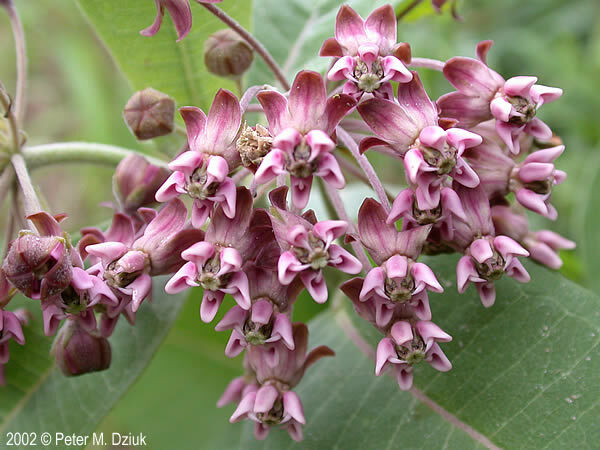 Asclepias syriaca is a perennial herb, 1-2 m tall, stem stout, hairy, usually unbranched, colonial from massive, white, creeping rhizome with storage side shoots; roots can reach over 1 m deep; sap milky, toxic. 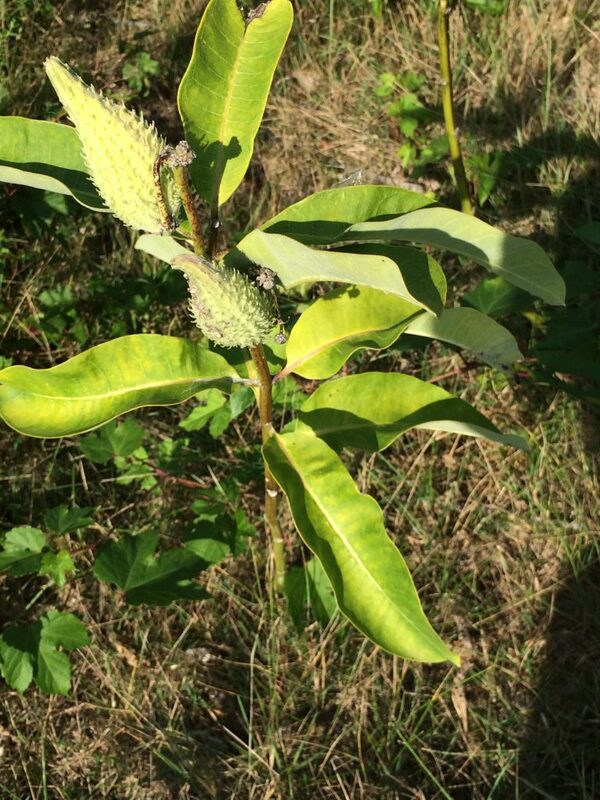 Leaves opposite, stalk 0.5-1.5 cm long, blade 10-26 cm long, 40-18 cm wide, oblong to broadly oval, thick, tip blunt or barely pointed, hairy below. Asclepias syriaca flowers close-up. 2002 © Peter M. Dziuk. Minnesota Wildflowers. minnesotawildflowers.info (Accessed 10/2017). Flowers dull pale purple, very fragrant, radially symmetrical, 5-parted, petals bent downward, stamens fused around style into a central column that is sheathed by a ring of fused scales (hoods), each scale bears a small horn on its internal surface, the entire central structure called the corona, a signature structure of Asclepiadaceae (see Asclepias Genus); inflorescence of large, rounded umbels; obligate outcrosser (self-incompatible) produces nectar 24 hrs per day, daytime pollinators include bees (Apis mellifera), wasps (Microbembex monodonta, Tiphia clypeata), flies and butterflies, nocturnal pollinators moths (Jennersten and Morse 1991; Rau and Rau 1970), June-Aug.
Fruit pale green, becoming dry, a pod to 12 cm long, broad around middle, tip pointed, base round, surface warty, hairy, held upright on bent stalk, splitting open to release seeds; seeds numerous, ca 0.9 cm, flat, brown, with white silk tuft, preyed upon by the weevil Oncopeltus fasciatus (Handel 1983), wind dispersed Sept., Oct. (Levine 1995). Seeds will not germinate until at least a year after dispersal (Bhowmik and Bandeen 1976). Winter stalks often with empty pods still attached. 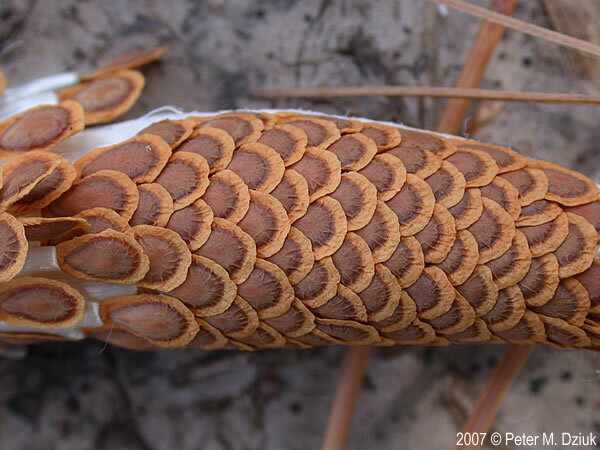 Asclepias syriaca seeds in pod, close-up. 2007 © Peter M. Dziuk. Minnesota Wildflowers. minnesotawildflowers.info (Accessed 10/2017). Habitat: Open areas, old fields, roadsides, fill, abandoned lots. Asclepias syriaca.fruit and seeds.commons.wikimedia.org (Accessed 10/2016). Notes: Plants need at least 30% full sun (Bhowmik and Bandeen 1976). Eaten by Curculionid and Cerambycid beetles (milkweed beetle, Tetraopes teraophtalmus) and Lygaeid bugs (milkweed stink bug Lygaeus kalmii), (Wilbur 1976; Broyles and Wyatt, 1988; Bhowmik and Bandeen 1976). Attacked by aphids that are in turn preyed upon by a number of other insects including ants (Formica fusca), beetles (Coccinella transversoguttata, Brachyacantha ursina, and Adalia bipunctata). 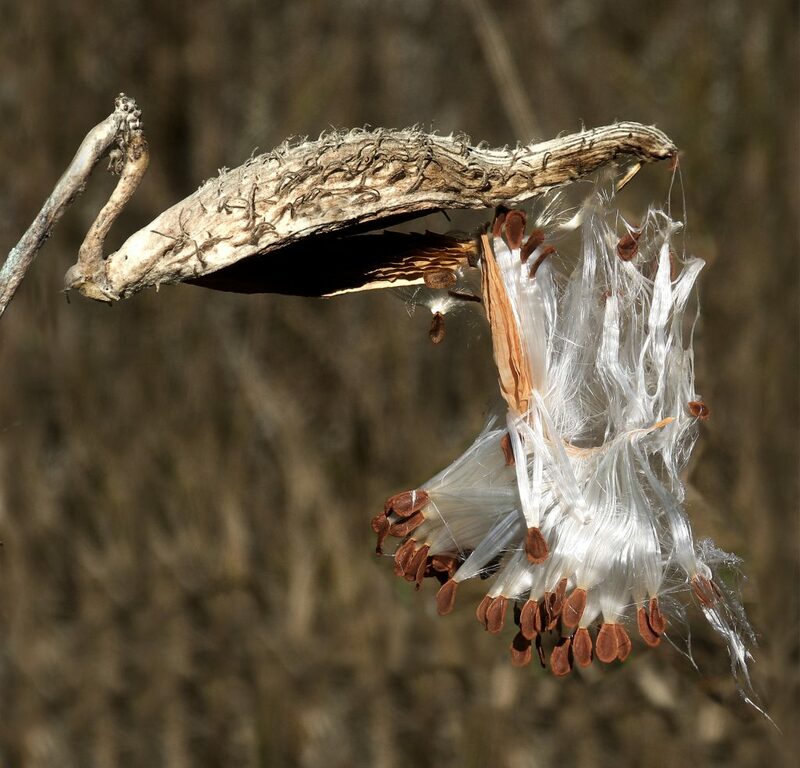 Common milkweed is parasitized by several fungi, the most frequent of which Cercospora clavata. The sap is home to flagella bacteria (Bhowmik and Bandeen 1976). Considered to be toxic (Kingsbury 1964).